Cooking Basmati Rice perfectly has always been a challenge for me in the initial days when I started cooking. The perfect myth is the soaking of basmati Rice and good quality of basmati Rice to be used while cooking. In the Pressure Cooker method always a understanding is required while cooking the rice .So I recommend to follow the ratio which I have mentioned below and the adjust according to your cooker’s way .This ratio works perfectly for me it has never failed me. 1. In a pressure Cooker add in 1 tbsp oil and wait till the oil heats up. Once it start heating add in the Bay leaves, Cardamom, Cinnamon and Cloves and fry till a nice aroma comes out. Soak the Basmati Rice in Water for about 25 mins before you start cooking and then add in the Soaked Basmati Rice in pressure cooker once the Whole spices emits a nice aroma and fry for about a min. 2. Next add in a tsp of oil to the Basmati Rice however this is optional. This addition of oil bring a shiny texture to the rice once it’s cooked. Now add in the measured 1 ¼ cup of water mix well and then add in salt .Finally wait till the water starts to boil. Then close the lid of the pressure cooker and wait till the steam comes out of the pressure cooker and then put the whistle and cook for about 1 whistle in high flame and then switch off the stove. Wait till all the pressure gets released by itself and then remove the whistle and open the pressure cooker and carefully fluff up with the fork. The Basmati Rice will be cooked perfectly we can use this in our cooking. 1. Soak the Basmati Rice in Water for about 25 mins. In a big vessel bring in lots of water to boil, add in the required salt. Once the water comes to boil add in the Soaked Basmati Rice. 2. Allow it to cook till the right consistency is reached. Check occasionally if the rice is cooked or not .Once the perfect consistency is reached switch off the flame and then strain the water using a strainer. Allow the Basmati Rice to cool for about half an hour before you use in any of your cooking. Always clean the Basmati Rice well and the allow it to soak for about 25- 30 mins before you start cooking. If you use a tsp of oil in the vessel after adding the Basmati Rice the Rice will be shiny after it’s cooked. 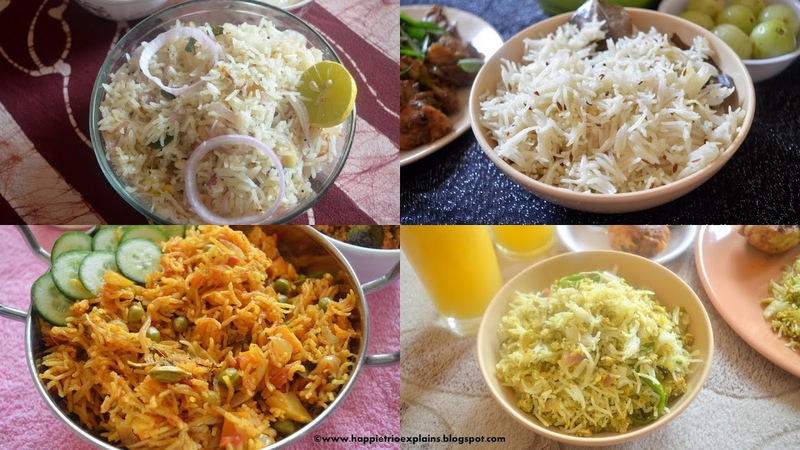 This is a basic recipe and we can use the cooked Basmati Rice in many ways .Such for any Lunch box recipes like Mango Rice, Egg Rice, Lemon Rice, Tomato Rice.